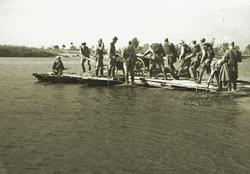 One of the costliest operations of the war, the casualties are estimated at being from 1,700,000 to 2,700,000 on both sides. One of the most tragic events took place during the establishment of so-called Bukryn lodgement near the village of Malyi Bukryn (Myronivka Raion). 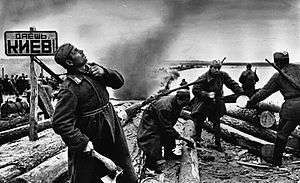 The Soviet writer and war veteran Viktor Astafyev in his memoirs was recalling that 25,000 soldiers who entered the Dnieper from one side, would exit the river on the other side in amounts of 5-6,000. Due to heavy losses, STAVKA theorists came under pressure from both above and below to modify broad-front advances with the more concentrated blow of Deep operations, and the Dnieper Airborne Assault became the last mass airborne operation used by the Soviet Union during the World War II. 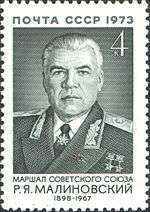 2,438 soldiers were awarded the Hero of the Soviet Union which was more than had been awarded previously since the award's establishment and never again was there such a big number of laureates. 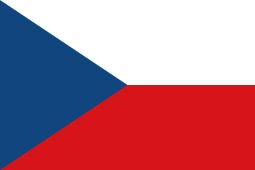 The operation begun on 26 August 1943. Divisions started to move on a 1,400-kilometer front that stretched between Smolensk and the Sea of Azov. Overall, the operation would be executed by 36 Combined Arms, four Tank and five Air Armies. 2,650,000 personnel were brought into the ranks for this massive operation. The operation would use 51,000 guns, 2,400 tanks and 2,850 planes. 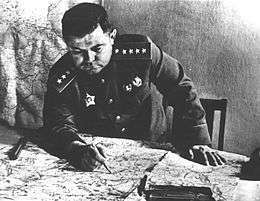 Faced with such a situation, the Soviet commanders had two options. The first would be to give themselves time to regroup their forces, find a weak point or two to exploit (not necessarily in the lower part of the Dnieper), stage a breakthrough and encircle the German defenders far in the rear, rendering the defence line unsupplied and next to useless (very much like the German Panzers bypassed the Maginot line in 1940). This strategy, however, would give the Wehrmacht time to maneuver more reserves and furthermore, would expose the Soviet troops to out-flanking mechanized attacks. 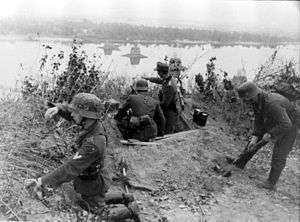 The second option would be to stage a massive assault without waiting, and force the Dnieper on a broad front. This option left no additional time for the German defenders, but would lead to much larger casualties than would a successful deep operation breakthrough. Stalin and Stavka nevertheless chose the second option. 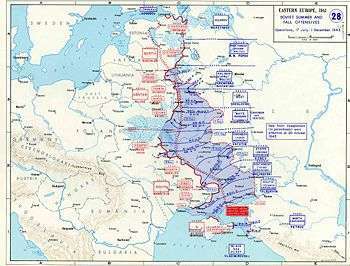 As corps elements made their 170 to 220 km flights from four of five fields (one of which received no fuel), troops (half of whom had never jumped, except from training towers) got briefed on drop zones, assembly areas and objectives only poorly understood by platoon commanders still studying new orders. Meanwhile, Soviet aerial photography, suspended for several days by bad weather, had missed the strong reinforcement of the area, early that afternoon. Non-combat cargo pilots ferrying 3rd Brigade through drizzle expected no resistance beyond river pickets but, instead, were met by anti-aircraft fire and starshells from the 19th Panzer Division (only coincidentally transiting the drop zone, and just one of six divisions and other formations ordered, on the 21st, to fill the gap in front of the 3rd Tank Army). 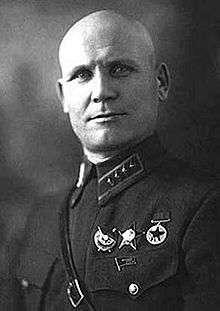 Lead aircraft, disgorging paratroopers over Dubari at 1930, came under small arms, machine gun, and quad-20 anti-aircraft fire from the armored personnel carrier battalion (Pioneers) of the 73rd Panzer Grenadier Regiment and elements of the division staff of 19th Panzer Division. Some paratroops began returning fire and throwing grenades even before landing; trailing aircraft accelerated, climbed and evaded, dropping wide. Through the night, some pilots avoided starshell-lit drop points entirely, and 13 aircraft returned to airfields without having dropped at all. Intending a 10 by 14 km drop over largely undefended terrain, the Soviets instead achieved a 30 by 90 km drop over the fastest mobile elements of two German corps. German losses, however, are more difficult to evaluate. 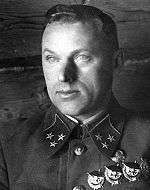 Shefov and other Soviet/Russian historians quote casualties as high as 1,500,000. 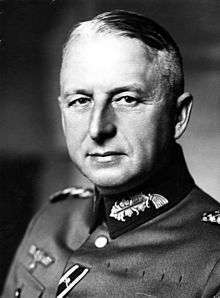 On the other hand, Erich von Manstein in his memoirs 'Lost Victories', claims about 400,000 total losses. Considering total disposition of German forces and their overall lack of strategic reserve in the form of manpower, the former number is surely an exaggeration, but considering the political aspect of postwar German autobiography, the latter number is likely too low. ↑ "Archived copy". Archived from the original on 2010-03-30. Retrieved 2011-01-10.